I was amazed and delighted to receive the Kreativ Blogger award from ‘Among Ghosts’ AND the Versatile Blogger award from ‘Life as I know it …”!!! They feel like a belated Christmas pressies – how wonderful! I gather that I now have to nominate other bloggers to receive these prestigious awards – so not only am I the grateful receiver, I am a judge too – lol! So, here is my list and I do hope you will take the time to take a look at these blogs. I enjoy them all for many different reasons. Not all of them follow my own beliefs to the letter, but then that is what makes life interesting! 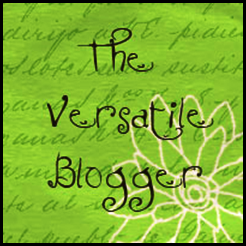 Also, part of receiving these awards, is that I have to share 7 things about myself for the Versatile Blogger Award and 10 things that not everyone would know about me for the Kreativ Blogger Award….. hmmm … tricky or what? 1) I’m a ‘cougar’ – lol – I don’t feel like one but I gather I am as my husband is 13 years younger than me! 2) Strangely, my Mother-in-law is the same age as my ex-husband … isn’t life odd? 3) My body is one age (too old for my liking), my heart is years younger – see above! 4) I adore animals and if I won the lottery I would love to set up an animal sanctuary. 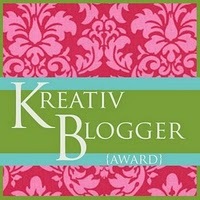 Readers for the Versatile Blogger Award should stop reading now, for the Kreativ Blogger Award you are ‘allowed’ to read on! Now all I have to do is work out how to send this information to all the above mentioned bloggers! It took me over an hour to sort the award pictures, and I haven’t yet read up how to pop them on my blog yet …. but I can do that later! Thanks once again to ‘Life as I know it…’ and ‘Among Ghosts’, I love both your blogs and look forward everyday to see what fresh insights will drop into my inbox. 25) Am I who I think I am? If you’d have read my previous blogs you will know that I am an identical twin. I am positive that I chose this for this lifetime to ensure that I could learn several lessons that I could only experience as one half of an identical pair. It’s very strange to think that my twin sister and I started out as one egg and one sperm and at some early time in our development, after the egg and sperm had fused, we chose to split in two! How odd is that? Theoretically then we should be totally identical, but if you know any identical twins you will know that there are differences, both physically and personality wise. However, often the physical differences don’t show so much until you are a little older. 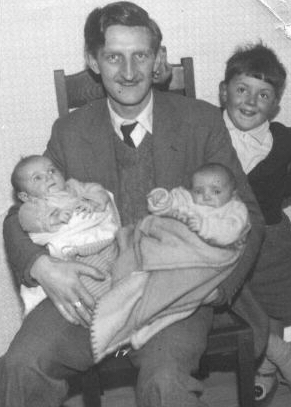 Mum told me that on many occasions when we were very small babies she did wonder whether she was confused about which one of us was which. She said we were absolutely identical and that she would ask Dad and sometimes even our brother Ray as well, to see who they thought we were! Mum said she was actually quite pleased when I fell out of my high chair when I was about 18 months old because I then had a small scar on my forehead. She said she’d often check my forehead to see if I was me or Tina! Relatives always became confused with us. I don’t think some of my aunts and uncles ever really knew which twin I was. It was sheer fluke that they would call me by the right name. I could almost see the relief of their face when I replied to them. It was like ‘phew, she didn’t realise I didn’t know who she was’, but it was a look I had learnt to recognise from a very early age. As we grew up we knew that teachers could never tell us apart, hence, as I said in an earlier blog, we would both be disciplined if one of us was naughty – purely because they could never work out who had been naughty and who hadn’t. It wasn’t too bad when we were little but when we first went to senior school it became pretty annoying. There were several occasions when teachers would bundle Tina and I together in a sentence, for instance ‘the twins have not completed their homework’ I would be infuriated, as I had completed mine and given it in on time, and would often stand up in class and state that I was an individual, much to the amusement of both the teachers and classmates. One of the other big problems that Tina and I shared was when we joined a new school. I remember distinctly the first day at our senior school. Nobody knew anyone else in the class and gradually over the course of the day it was obvious that people were becoming friends. The problem with being a twin is that everyone seems to think that you already have your friend and so you don’t need any others. The teacher hadn’t helped by putting us together at adjoining desks. It was like we were a self-contained unit. I have spoken to other twins and they all had the same experiences when they joined anything too. It’s the same even when you are a grown up. Although I enjoy going along to a new club or church with a friend, I actually prefer to go alone, as nerve-wracking as I find it, because you tend to meet more people when you are on your own. People can see you don’t know anyone and come over and introduce themselves, whereas if you have a friend with you they tend to leave the two of you alone. I do consider that even though I loved so much about being a twin, I also desperately wanted to be accepted as an individual. Most ‘singletons’ take their individualism for granted, they are just themselves, and they know that there is no-one exactly the same as them in the whole world. I know that sometimes people will say that someone is just like their brother or you can tell that they are sisters, but generally they have been born at least a year apart and so have not been in the same nursery, classroom or after-school clubs together. I found it was a tricky balancing act because whilst I adored the company of my twin, and we shared the same choices in so many things, I did still want to be me, and not always just be seen as one of the twins. When you are in a school with a strict uniform code it is very difficult to show that you are an individual. What didn’t help was that Mum cut our hair for years, and although I loved her very much, she was no hairdresser. We had the type of haircuts which I gather are called the pudding bowl cut, which meant it was chopped to the same length all the way round. Mum thought a fringe would suit us, but again, not being a hairdresser, she was not a natural stylist. She would always cut our fringes crooked, and the more she tried to straighten them, the shorter they’d become until we both had tufts instead of fringes. One thing I certainly wasn’t was stylish! In my early teens an astigmatism in my left eye became more apparent and in a funny way it was a blessing, because at last people could see a real difference between Tina and I. I was the one with the wonky eyes. My left eye had a mind of its own and I could tell that people didn’t know which eye to look in when they talked to me. I can’t remember minding that at all, but when I started suffering from double vision then we knew we had to do something about it. I was sent off to the local hospital every Wednesday afternoon for eye exercises. It was basically a gym for my eye muscles. I’m not joking! Two cards would be placed on a stand either side of me, one with a seal and one with a ball and I had to try to use my eye muscles to put the ball on the seals nose, another one was a cage on one card and a lion on the other. I had to try to put the lion in the cage. Very strange really. When I was fourteen it was decided that my muscles just wouldn’t do what I was telling them so I had an operation to straighten my eyes. It was fantastic as I had no more double vision, but the downside was that Tina and I were back to looking the same again! We had always shared a bedroom until our brother left home and it was then agreed that we would take it in turns each having the bigger bedroom for a month and then the smaller bedroom for a month. The problem was that having always slept in the same bedroom it felt so strange to sleep on our own. Without any knowledge at all, one of us, or often both of us, would go into the other bedroom during the night. Mum would often come to wake us in the morning and find that we were either in the same bed or that we had swapped rooms in the middle of the night. Even at that age Mum would have problems telling us apart and very often would call us by the wrong name! In our final senior school year it was obvious that my sister and I had different strengths and weaknesses where our studies were concerned. I would always have to work very hard to try to remember anything, whereas Tina could just read something once and remember it straight away. I would spend hours and hours working on a piece of homework, Tina would just spend about twenty minutes and complete the work brilliantly. Strangely enough though over all our school years we worked out that our average marks for every subject was actually less than 1% different. Quite amazing. The problem though was that our school also based its class position on behaviour and attendance. I was far quieter than my twin and would never consider not attending classes. Tina would skip anything she didn’t feel was essential, which normally would have been fine, but she hated physical education and couldn’t see the point in attending classes for netball or hockey, so used to go and sit in the art room with her friends when the classes were running. On the other hand, although I was no great athlete, I always turned up for the P.E. classes and tried my best. When we received our last reports from the school my average mark was the same as Tina’s, which on the face of it appeared fine, but when we went through the marks for each subject and the reports the teachers had written it became clear that our P.E. teacher had us completed confused. I received a D and a damming report, Tina received a B+ and a ‘well done for trying’ remark. Talk about unfair! I am sure that my experiences growing up as a twin, being obviously different from most others and also having to fight for my individuality, were lessons to help me to learn that it’s ok to be who you truly are, and that no matter what your birth circumstances, you can still carve out your own niche. Having my spiritual awareness and beliefs has put me apart from people most of my life, but it is only in the last fifteen years or so that I have felt bold enough not to just accept those differences but to embrace and celebrate them. I learnt that I do not have to justify why I am who I am, which is how I had felt through so much of my growing up. I am just me, Tisha ……. but, I do sometimes still wonder …… was it me or Tina who fell out of that high chair?